A gorilla permit is a license issued to the traveller allowing them to be guided in the gorilla jungle to find a habituated gorilla family and spend close to 60 minutes in their presence. An exhilarating activity done in only three countries in the world – Uganda, Rwanda and DR Congo. Gorilla permits are issued by government conservation authority bodies in the respective countries. In Uganda, you can only book gorilla permits with Uganda Wildlife Authority (UWA). In Rwanda, Rwanda Development Board (RDB) issues the gorilla permits. Booking gorilla permits with the government authority may turn out to be cumbersome for you, we recommend you seek help of a travel agent to simplify the process for you. Gorilla Safaris Uganda offers this services to its travellers and we would be gland to help you out and include this in your trip price at no added cost. How much do gorilla permits cost in Uganda or Rwanda? A Gorilla permit in Uganda for Bwindi Impenetrable National Park and Mgahinga National Park costs USD $600 per person (May 2018). A Rwanda gorilla permit for Volcanoes National Park cost USD $1500. This was increased recently from $750 in case you’re wondering. Uganda Wildlife Authority 2018 to 2019 has not offered discounted rates on gorilla trekking permits and chimpanzee tracking permits, the prices will be maintained at $600 and $150 respectively. UWA has always been reviewing its prices and tariffs every year to $450 during low seasons, April and November but not this time. The number of people allowed to go gorilla trekking in Uganda or Rwanda is restricted on a particular day. This is done to ensure least behavioral disturbance to the mountain gorillas as well as reduce the risk of them catching contagious human illnesses. A maximum of 8 people are allowed to trek each gorilla group per day. That restriction makes it competitive to book gorilla permits especially during peak seasons. It is therefore necessary to book permits as early as possible. We strongly advise you book at least 3 months in advance to ensure that you can track on the requested date, especially if you plan to trek during the peak season (school holidays) or if you are in a large group. So far, we have eight groups for viewing. 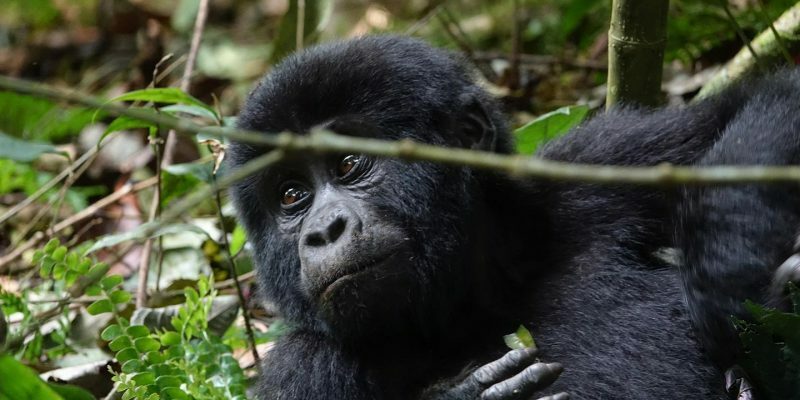 There are four groups in Bwindi Impenetrable National Park, (Mubare, Habinyanja, Rushegura, and Nkuringo) and one (Nyakagezi) in Mgahinga Gorilla National Park. New Gorilla Families are yet to be officially opened for tracking safaris. You require a gorilla permit to trek Uganda gorillas found in two National Parks of Bwindi Impenetrable National Park and Mgahinga Gorilla National Park all found in south western Uganda. Gorilla permits can be obtained from Uganda Wildlife Authority Head Offices in Kampala just after Uganda Museum on Kiira Road. Every day, UWA sells gorilla permits for all gorilla families in Bwindi Impenetrable National Park and Mgahinga. Offices are always open from 9:00am to 5:00pm in the evening. Please contact us for your gorilla permit which we can pre-purchase for you at no extra cost once you book a gorilla safari with us. Please contact us and we will check availability of gorilla permits at UWA for you and go ahead to buy once you have transferred money on our account. You will need to send us your details in terms of names, passport number, and nationality as Uganda Wildlife Authority requires them in order to issue your gorilla permit. You need to contact us to advise you on when to book your gorilla permit. It is agreed that for peak and high seasons, you need to book your gorilla permit at least 5 months in advance while in low seasons, you can even book it there and then. High gorilla trekking seasons in Uganda are June, July, August, September and early November and then December, January and February. Gorilla permits tend to be very scarce and if you intend to trek gorillas during this month, you need to book them way back in advance. Please do contact us for a gorilla permit booking and we will secure it for you at no extra cost once you book a gorilla safari holiday tour with us. You can still book a gorilla permit by your self by calling Uganda Wildlife Authority offices. They can be reached on +256-414-355402/3/4/5 and you will talk to one person in reservations who will then tell you if gorilla permits are available. They will provide you with a form which you need to fill and then transfer funds to their account. Once they receive the money, they will then book your permit. On arrival in Uganda, you have to go to their office in person with all your identifications to pick your gorilla permit. The only challenge with this method is that you might call and call and call and nobody picks due to the traffic caused by those calling reservation but please keep trying and someone will pick your phone. Uganda Wildlife Authority allows advanced booking of up to two years as long as a deposit of 30% is made and the balance shall be paid 91 days to the tracking date. Late top up of 70% is not permitted but may be considered 7 days, and will attract a Surcharge of 20% beyond which deposit is forfeited without refund. 80% of all the gorilla permits in each month can be booked for two years in advance by the Association of Uganda Tour Operations (AUTO) members only. Foreign tour operators will book through local tour operators. Each tour operator (AUTO) shall book up to only 20 permits for that particular month on the day the booking opens, which is the first working day (Monday to Friday) of the month. Interested in visiting Bwindi Impenetrable Forest?